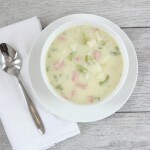 I have been making this ham and potato soup for ten years now. It is my go-to soup recipe for potlucks, family parties or for an easy family dinner anytime. It is fast and easy and it doesn’t call for many ingredients, it’s probably why it’s been a favorite for so many years! My kids went through a phase where they loved the movie Ponyo. In that movie the little girl loves ham, so we started calling this Ponyo soup. We still call it that and my youngest daughter hasn’t even seen the movie! My kids always look forward to Ponyo soup. You can use whatever chicken bouillon you have in your cupboards, but I recommend Better than Bouillon! It really does taste so much better. If you have Better than Bouillon you would use the same measurement as the regular bouillon in the recipe. Combine the onion, celery, potatoes, ham and water in a large stockpot. Bring to a boil, then cook over medium heat until potatoes are tender, about 10 to 15 minutes. Stir in the chicken bouillon. Meanwhile, in a separate saucepan, melt butter over medium-low heat. Whisk in flour and cook for one minute, whisking constantly. Slowly stir in milk and whisk to combine. Continue stirring over medium-low heat until thick, 2-3 minutes.